ChargeIt by Jay Aristocrat Brown Oak Charger Plate 13"
Home > Products > ChargeIt by Jay Aristocrat Brown Oak Charger Plate 13"
Set a sophisticated table with the ChargeIt by Jay Aristocrat Brown Oak Charger Plate 13". 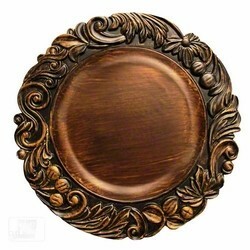 Beautifully accented with a carved-style ornate rim detailing, this charming charger plate in brown oak provides a striking backdrop for upscale plates, platters, and bowls allowing specialty dishes to take center stage. Ideal for multi-course meals, this charger accommodates any size plates, platters, and bowls and provides protection against spills and mess. Made from high quality polypropylene , this lightweight charger plate boasts unbeatable durability and product life.